Hope you all had a wonderful Easter Fool's Day! This is not a prank: Did you know each month we host FREE continuing education webinars on topics that range from all things NFPA 70B & 70E, How to Develop Effective Safety Programs (EFPs), How to Reduce Risk with Engineering Controls, and much more! Last month, our focus was on Accountability Systems: From Good to Great in Safety. This webinar will help attendees to understand how to "measure Safety" in appropriate terms and how to hold everyone in the organization accountable (not blame them) for their part of the Safety process. If you're interested in learning more about what these webinars have to offer, click here to view the recorded version of our March webinar. 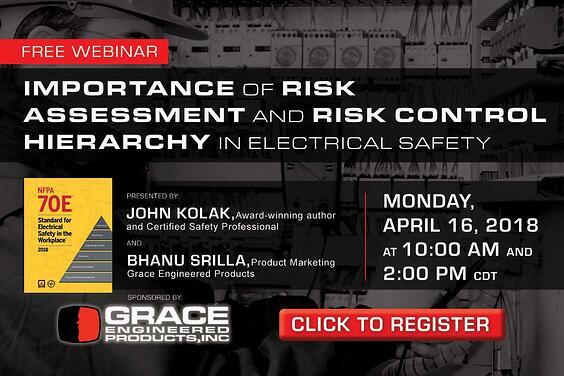 This month, we will be focusing on NFPA 70E and the Importance of Risk Assessment and Risk Control Hierarchy in Electrical Safety. Click on the registration link below if you are interested! Risk reduction is the foundation of a profound electrical safety program. Electrical safety is all about minimizing risks to acceptable levels that protect both workers and employers from devastating effects of electrical shock and arc-flash hazards. Electrical safety is only achieved when the equipment design, safety controls, policies and procedures all come together in harmony when a task is performed by the worker. No piece of equipment, device, or a safety policy by itself can make a system absolute safe. It is imperative that employers thoroughly understand, identify, analyze, and evaluate the risks their workers’ are exposed to while performing their tasks and implement robust risk control techniques and procedures in place to protect their workforce. Recent changes to NFPA 70E, 2018 standard puts more emphasis in risk assessment area by introducing risk control hierarchy to the standards section and further added human factors, such as human error to the risk assessment. This webinar will focus on the basic principles of risk management, hierarchy of risk controls, hazard based and task based risk assessment methods. Additional topics of discussion will include changes to NFPA 70E on risk assessment, guidance and sample job hazard analysis examples with risk quantification calculations in mechanical and electrical LOTO tasks.